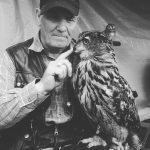 Hi, my name is Michael and I would like to take this opportunity to introduce myself and tell you how I became interested in keeping Owls and other Birds of Prey. This is Jammu (above), he was my 1st Owl to be hand reared. My obsession with these beautiful creatures started when I was around the age of 15. I would wander into the countryside and watch the Kestrels behaviour in their natural habitat, all this fascination started me to paint and draw Birds of Prey. Although I was new to painting and drawing; my family and friends thought that my artistic talents should be put to good use. After spending countless days painting and drawing these fantastic creatures; my works of art have now been distributed amongst family and friends. As the years passed by (which were very quick!) my time was taken up by my family. It is only in the past few years that I have had the time to pursue my lifes ambition of actually owning an owl. I gained my knowledge through constant reading and researching books on Birds of Prey. I now have a number of Owls and 2 Harris Hawks (which you can find on this website), some of which came to me due to their injuries or neglect. Each of my owls have their own individual personalities and have very distinctive characteristics. 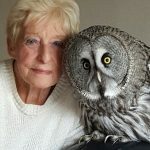 Like myself my friend Margaret seen in the picture below, has since taken up this hobby of looking after injured owls and Birds of Prey. Both myself and Margaret attend shows and private functions, giving talks on owls and other Birds of Prey and how in this day and age are becoming endangered due to todays environment. We both now rehabilitate and protect Owls & Birds of Prey. For anymore information on ourselves or our birds why not come and visit us at the events we attend, full details can be found on the events page within this website.